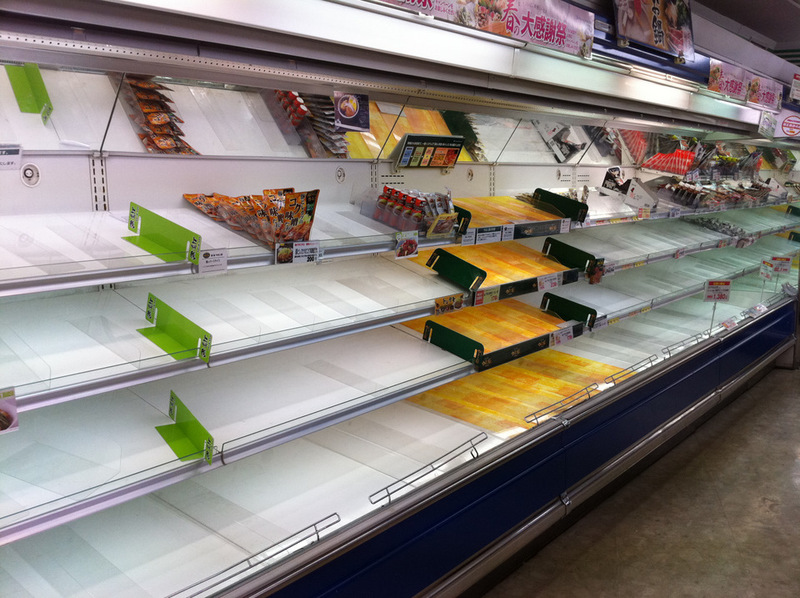 A few people have asked me about convenience stores and supermarkets since the earthquake. Most people are calmly going about their activities, obviously worried about images they see on television from Sendai and other parts of Northern Japan. We are hearing minute by minute reports of trouble at nuclear reactors and seeing scenes of towns like Minamisanrikucho which have been literally washed away by tsunami waves. The aisle on the left used to have lots of instant ramen. Here in Tokyo the scene is quite different. Apart from some isolated damage to factories and some buildings, most of the issues we are facing are nothing like those in the North. The supermarket shelves look a little bare at the moment, but it is hard to say whether panic buying or just lack of incoming supplies is the problem. People don’t appear panicked and a shopkeeper mentioned to me that the truck supplies just were not arriving at the moment. In general, life in Tokyo is quite orderly and people are not causing a panic. They seem more worried about their friends and family members who are suffering near Sendai. From Monday we are expecting rolling power outages due to a shortage of running electricity generators. We are being asked to conserve power where possible, particularly as business get back to work. Seeing stuff like this is reassuring that not all is bad over there. I want to say more, but that’s all I can say right now.